Dead and Alive was made during artist’s residency at the Dharamshala International Artists Workshop 2012, (Khoj International Artists Association & White Crane Films) and in collaboration with a master mask-maker Lobsang Dhoyou. It is a response to the artist observing the impact of the news of self-immolations on the local community in Dharamshala, an exiled home of the Dalai Lama and the Tibetan Government. Self-immolations are the ultimate form of protest by Tibetans in China and are perceived by many as an act of the ultimate courage and desperation. Those who undertake it suffer an agonising death and the consequences this act might have for the cycle of their rebirth as self-harm and distraction of life are against Buddhist beliefs. The work takes a form of a mask created for two worlds. 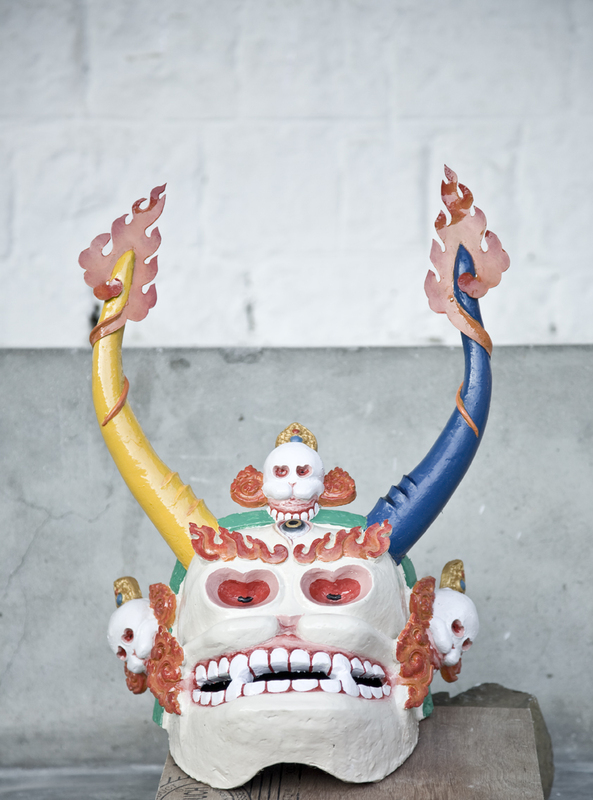 Inspired by traditional Tibetan Cham masks, it assimilates attributes of Tibetan deities: Thur Dhag, protector of the dead represented as a human skull, and Yamantaka, a flame-adorned ox, protector of the living, “the Slayer of Death”, who helps to channel anger into pathways leading to progress. Traditional process of Tibetan clay sculpture involves mixing clay with paper, modeling and drying in the sun without baking. When dried, the masks are frequently painted. Whilst this process can take up to three months, the artist had two weeks in which to create the work. 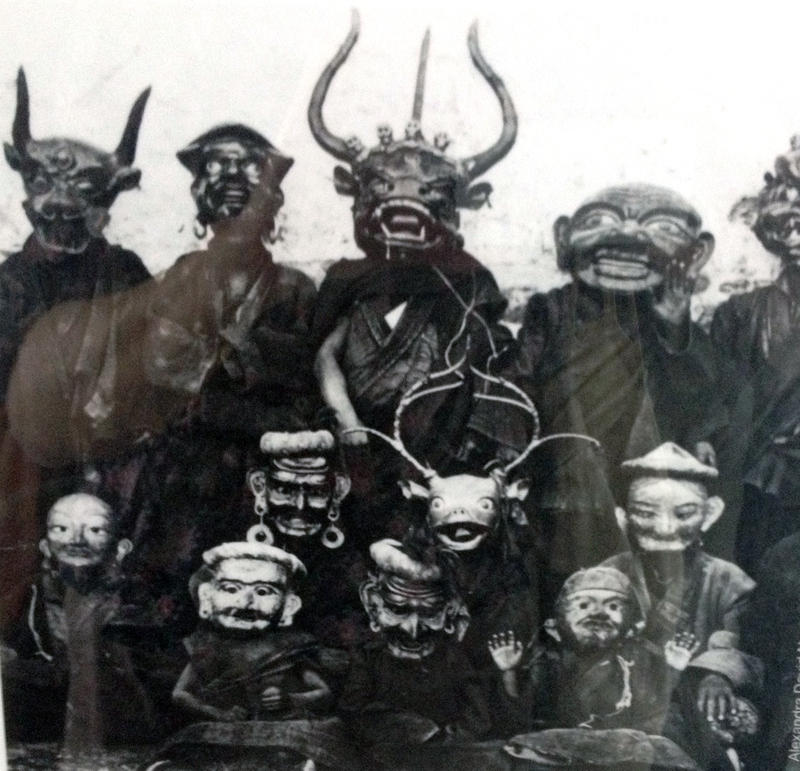 In their attempts to understand each other and to complete the work within given time, the collaboration between the artist and the mask-maker became an exchange about issues relating to freedom, production, philosophy and position of art in traditional Tibetan communities and global contemporary art settings. A conceptual grounding and the identity of its maker would deem this work politically contencious, if not illegal in China. Thinking about an interplay between deeply rooted spiritual beliefs and current context of struggle for Tibet’s freedom, Dabrowska blended traditional motifs of Cham masks with contemporary references and vernacular aesthetic: a female eye in the center of its forehead is an ancient symbol of all encompassing knowledge, but her eye sockets contain two pulsating hearts, the horns refer to the stateless status of exiled Tibetans (who instead of passports are issued a “Yellow Book” and a “Blue Book” in India), whilst the numbers painted on the back of the mask refer to 7 people who self-immolated during 2.5 weeks of the artist’s residency. As a work in progress with an unspecified completion date, the mask represents to the artist the open-ended status of this issue as well as her intention to strip the current paint layer and complete the work again “when its time has come”. The mask has traveled to her studio in London where it awaits its rebirth, a reminder of the journeys we take and the often-mysterious transformations affecting us in the cycle of life. ” Could you work slower?” – Master Mask Maker answered. *Lobsang Dhoyou, master mask maker, born in Kham province of Tibet, an ex-monk in exile living in Dharamshala since 1992. He studied under the guidance of Venerable Kalsang Dorjee. A chief sculptor of the Tibetan Martyrs Memorial in McLeod Ganj. Dharamshala International Artists Workshop, (Khoj International Artists Assocciation / White Crane Arts and Media, 20 Oct – 1 Nov 2012). Khoj International Artist Association (New Delhi, India) has a long tradition of running workshops and residencies that offer international and Indian-based artists time and space for exchange and development of new ideas. These often take place in locations around India, which are removed from the established centers of contemporary art production. In 2012, Khoj teamed up with White Crane Films (founded by filmmakers/artists Ritu Sarin and Tenzing Sonam) to bring the workshop to Dharamshala, a rapidly expanding global destination for pilgrims and tourists. The participating artists had an opportunity to engage with the complex social and political history and current significance of Dharamshala, to produce works that addressed issues of local identity, culture and politics. The workshop culminated in an Open Day exhibition in Mc Loeod Ganj, exile home of the Dalai Lama, the headquarters of the Tibetan Government in Exile, and home to a growing Tibetan Diaspora.